Small group backcare classes are conducted by Jane DoCampo, C-IAYT. They have a fun dynamic and are supportive and informative about your condition. You learn from the questions and issues of your classmates that arise during class and benefit from the ability to observe others. ​Classes take place in a multi-week series so that you will experience the results of your commitment. April series run April 1 through April 25. 60 min 4 class series = $120. 75 min 4 class series = $140. You can join a series in progress if there is space! In all classes we use wall ropes and other tools of alignment based yoga and yoga therapy to teach you about your negative postural patterns and strengthen your whole body to support your spine. At the base of the pelvis are our bottom core muscles of support for the pelvic organs, as well as healthy systems of elimination and sexual function, and a pain free back. 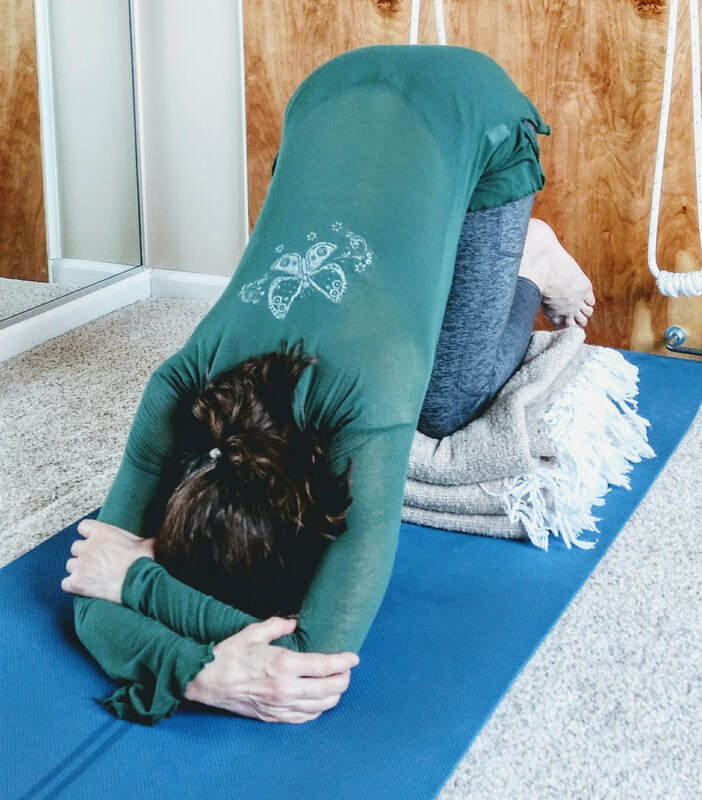 In this alignment based yoga class we work to bring balanced strength to the pelvic floor and all surrounding muscle groups to support the weight of the body above. Scoliosis will worsen over time if left untreated. Curve specific exercise can help you. Take action to improve your scoliosis. Learn about the rotation of your spine and your lateral curves and do work to lengthen, de-rotate, and strengthen around improved alignment. Even if you have had fusion surgery, you need to work to improve your scoliotic pattern and strengthen above and below your fusion where the body becomes hypermobile. And for teens newly diagnosed with scoliosis, watching and waiting is the worst advise. The sooner your teen learns curve specific exercises to restrain the curve pattern, the better.